Your apprenticeship combines time at work with time at the F-TEC training centre – so you get practical experience as well as the skills and knowledge you need. You'll spend most of your time working, with the rights and benefits of a normal employee, and you'll be paid. This is where the important, vocational competence (VCQ) part of your apprenticeship qualification is carried out. The employer is responsible for your day-to-day activity, and your health and safety. Your employer will arrange a mentor to show you the ropes, and help you through the work-based parts of your learning, which will be monitored and assessed by learning and development specialists, Karl Baum Associates, who manage the apprenticeship programme. Expert knowledge will be delivered through practical and theoretical training sessions. Your abilities will then be be evaluated through practical activities and online assessments. You will attend 5 weekly blocks per year at F-TEC in Swindon. There you will study Level 2 Lift Truck Maintenance and Repair, which is accredited through IMI Awards over a 2 year duration. At the end of Level 2, you will have the opportunity to progress to Level 3 and beyond. Whilst at F-TEC, you will stay at a local 3 star hotel that includes leisure facilities. Your employer will pay all travel, accommodation and meal expenses whilst you are on your training programme, unless you live close enough to commute each day. 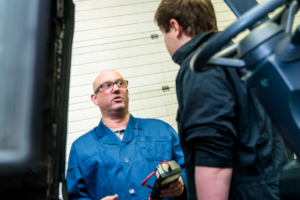 Having successfully completed all elements of the Technical Certificate, Functional Skills and VCQ assessments you will be awarded the IMI Modern Apprenticeship in Vehicle Maintenance and Repair (Lift Truck). With this behind you, you can expect a satisfying and well-paid career; depending on the terms of your employment, this usually means moving into a full-time role at the company where you've completed your training. One further option may be to study for a more advanced qualification to give you even greater skills, and help you command a higher salary. If you are already employed as a trainee fork lift truck engineer, you will probably have discussed the prospect of an apprenticeship with your employer. In fact, that’s probably part of the deal. In these circumstances the employer will initiate the process. 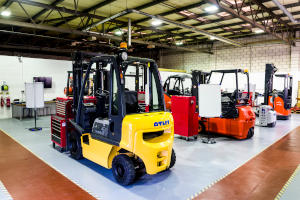 There is a special form that the employer completes and sends to the Fork Lift Truck Association (FLTA) office, who will then forward to the programme managers, F-TEC. If you are not employed, but are interested in a fork lift truck maintenance and repair apprenticeship, please just complete this form. There is no commitment when you do this. You are just registering an interest. You will be contacted by F-TEC who will assess your suitability and, if appropriate, they will help you find a suitable employer. (Please remember that F-TEC do not employ apprentices: the employer will be a fork lift truck company). "My forklift apprenticeship gave me the knowledge I needed to succeed." "Without doubt, my apprenticeship gave me the technical and practical knowledge I needed to succeed in my career. As well as studying, I spent time developing my skills in HFT’s workshop – nothing beats hands-on experience. 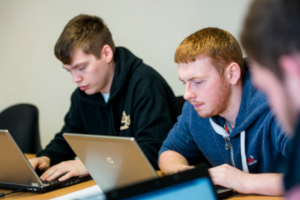 I’d definitely recommend an apprenticeship to anyone looking to work in this sector." 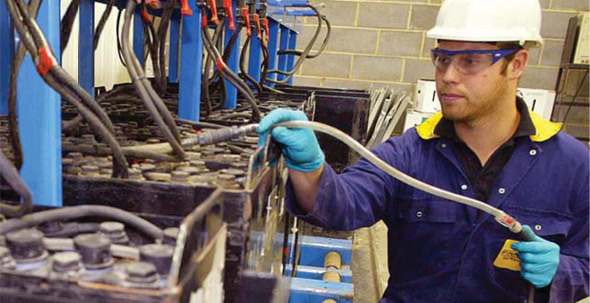 Fork lift trucks need real, hands-on engineers to find the problem, and get it fixed. Are you ready for a challenge? A fork lift engineering apprenticeship starts a great career in a thriving industry. Find out more here. Find out what being a fork lift truck engineer is really like.